Home › Uncategorized › Ask a Park Ranger…what do I need to know about going for a bike ride? Ask a Park Ranger…what do I need to know about going for a bike ride? 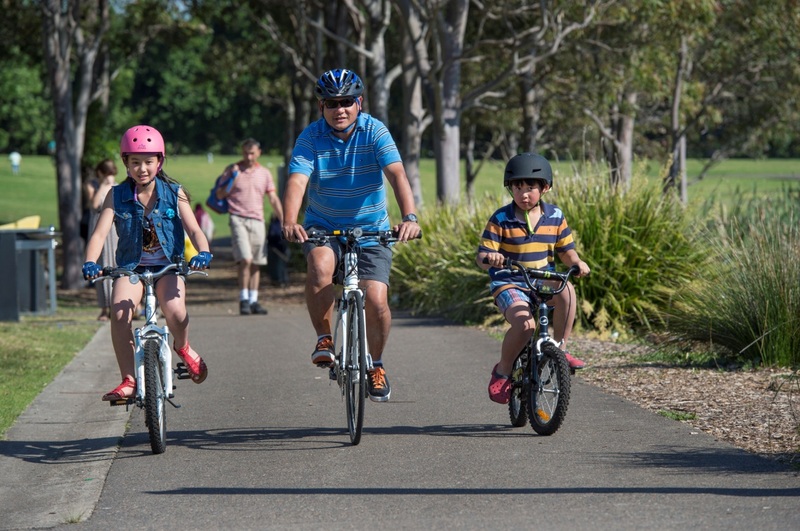 With over 35kms of shared cycle ways at Sydney Olympic Park it is no surprise we have 80,000 people each month come for a pedal! A helmet is a requirement across the site. Unlike your backyard, normal NSW road rules for cyclists apply no matter where you ride at Sydney Olympic Park. Please wear your helmet and remember to have the kids helmets correctly fitted. A badly fitted helmet can lead to injuries too. • Always ride with the kids. They get lost easily and need you to navigate. • Label each child with your mobile number and name so we can contact you if we find them lost. • Always give each child a water bottle. If they get away and get lost they can get very thirsty. Yes, we have a speed limit on all share paths, that is 10km/hour. This is a fast running speed. When your speed is above this limit you run the risk of not being able to stop for other path users. Some corners are very tricky at higher speeds too. The parklands are not a velodrome. It is a place for a relaxing ride. Pedestrians have right of way over cycles. Many shared paths are close to children playing and families picnicking. Watch out for the kids. Overall, be courteous of others and put your safety first. If you see a Park Ranger in our green shirts give us a wave (but don’t fall off)!